Henry VII. The Wars of the Roses brought Henry VIII to the throne of England. 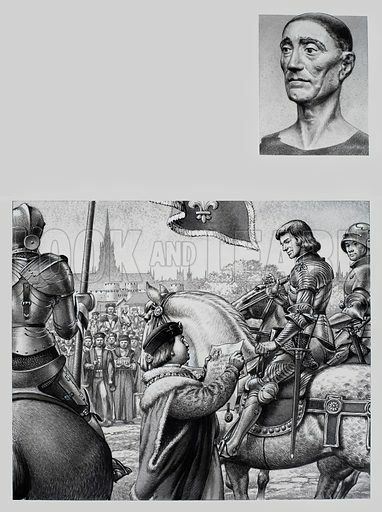 The drawing (top right) of him was taken from the King's funeral effigy in Westminster Abbey, London. When Henry rode into London in 1485, the mayor and aldermen marched out to greet their new and victorious monarch. Original artwork for illustrations on p2 of Look and Learn issue no 763 (28 August 1976). Available worldwide for immediate download up to 3,457 x 4,628 pixels.